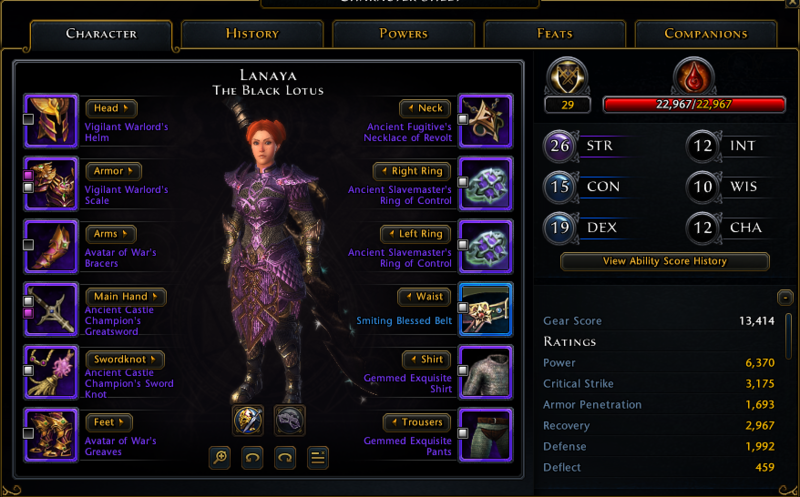 I play Lanaya@meeggtoast on Dragon Shard. This guide is mostly built for PvE destroyer, this build can also PvP. I am writing this guide in seeing many destroyer speced GWF not topping damage charts, to equally geared rogues. I have respec again for endgame instead of testing out stuff. I have 1 point in battlefury and maxed steel defense so I can do the last run for CN, from Xervos to Dracolich. I respected once already I did not feel that the unstoppable action’s 5 points is worth it for me to put 3 or 5 points into it. For non humans are 2/3 into Toughness, and 1/3 into Weapon mastery, or 2/3 into toughness 2/3 into armor specialization 2/3 Weapon mastery if you want that 1% more crit. Focused Destroyer is a key feat to this build. It makes that the destroyer passive can proc to even single target hitting thus overall gives a 12% total damage increase. Deep Gash is extra dps, Great Weapon focus 10% increase in your at wills, Disciple of war means recovery gives you free armor pen… 2 birds with one stone. WMS gives encounters 10% more damage vs 15% bonus to marked targets. Problem with GWF and mark in destroyer path, you don’t mark very much to take full advantage of the 15% damage, daring shout lasts too short, marks doesn’t stay long enough, aoe of it is also too short. If you try to combo it with Come and Get it, you might as well play cw because steal time acts like the same thing as daring shout + come and get it, aggros everything around you. And the damage buff isn’t significant enough for you to clean it all up, steal time gives CWs enough time to do something else. The other case is when you have a Guardian Fighter in your group. The times I’ve had a guardian fighter in my CN runs and T2 dds is less than 5% of the time. I personally think they are more out of a job in PvE, I don’t mind a good GF in my group just I don’t find them much useful. If you want tank, your dc should kite, gwf can off tank, rogue can offtank with ItC for short amount of time. If you want dps single target, grab a rogue, If you want aoe… grab a GWF. GFs are out of a job on this one. 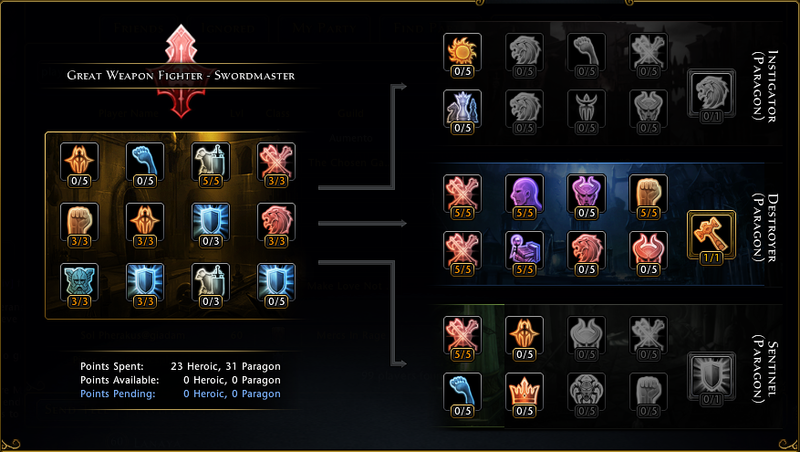 The point of this gwf build is to maximize damage if I were to maximize consititional focus with 3 points into it, it would provide me a bonus of 15% with 16 con it will yield me 0.9 more armor ignored. If and 0.9% more hp. If I were to pump my dex into con i would have 20 con with maxed constitution focus would provide more 1.5 more resistance ignored + 1.5% more hp, this is a DPS guide not a tanking guide. Put it perspective to you this way 1.5 – 0.9 resistance ignored is equal roughly 100-150 armor pen, for all thats worth I do not feel like 3 points into a feat that will yield me one rank 5 dark enchantment. Steely defense gives you 8% of ur defense, im at 2000 defense. so according to your build it will provide you with 160 power. Ur build gives 160 power 150 armor pen statwise. My build with 2000 defense, I have a flat 20% from my defense which yields 400 power. TL;DR 160 power 150 armor pen(ur build) vs 400(my build) power. which one is easier to stack? armor pen with low diminishing returns up until 2300. so constitution focus is not great except the nice little bonus hp you get which is around 1% or 200-250 hp. vs the raw 100 power you can get. As for the mark from a GF on your team. I have done 300+ CN runs, I have only seen GF on the runs less than 10 times, and the times I did see the GF, they were my friends. GFs doesnt make the run any faster, more CWs and TR/GWFs make the runs faster. Same as T2 dungeons. if a T3 dungeon with adds that can oneshot all 4 other classes, and require a tank to be on your team, then the GF is viable. As for Daring shout, all marked targets for gwf recieve 8% more damage from you. with Powerful challenge the total damage increase is buffed to 23%. In counting the time that mark is applied 23% for 12 secs and 3 secs on cooldown/cast time (0.23*12 +0.00*3)/15, the overall dps increase for having the encounter + the feat is 18.4% overall dps boost. Disciple of War, which gives you 25% of your recovery as armor pen. I have 3k recovery thus I have get free 750 armor pen from my stats. 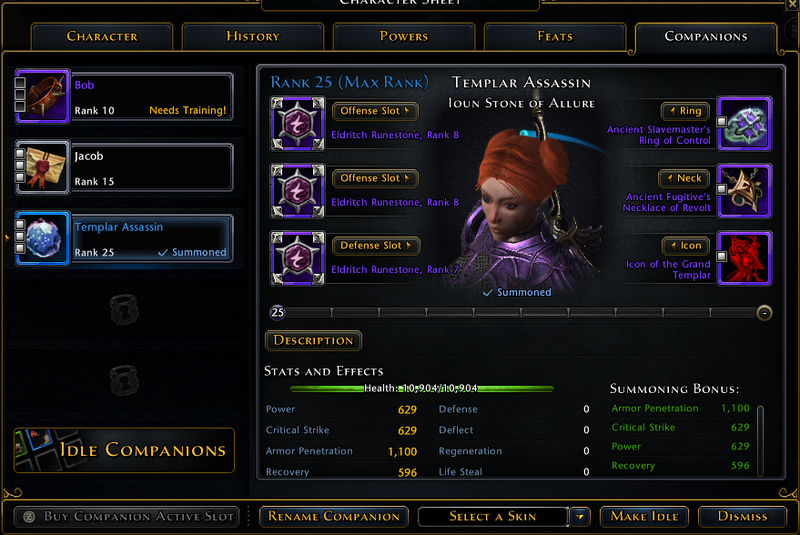 This means I can put 750 more stats into power, this roughly translates to 18.75 weapon damage. With drake sword of the Avatar of War I am able to test this. Drake sword with 750 more power damage: 835 damage per swing. This is a 129 damage increase or 835/706= 18.27% dps boost from the raw weapon damage increase from having Disciple of War. Considering that the damage increase from the 750 power is always there and that you don’t always mark all of the targets you hit because its a small 20″ aoe. Disciple of War beats Powerful Challenge. For lower geared GWFs Powerful Challenge > Disciple, but once you become more geared out Disciple wins over Powerful Challenge. Encounters: Flourish/Roar/PunishingCharge, Restoring/NotSoFast, Indomitable Battle Strike(IBS). Flourish is mostly for stacking Student of the sword feat and a good stun burst encounter. NotsoFast is your highest damaging 5 target spell. Punishing Charge is for fun. Note that Encounters can all have a chance to proc Steel Blitz. Encounters: Battlefury, Restoring/MightyLeap, Punishing Charge. I think they are equally good depending on your playstyle. I’m extremely biased toward human due to the extra 3 feat points. Reasoning is because late game/end game it is easier to stack armorpen(con) than crit since crit falls off heavily after 3k. Con GWFs can stack more power but they lose out in crit. That’s the ultimate trade they face. It is debatable crit vs armor pen, up to the player on how he wants to build it. Don’t get me wrong I think plaguefire is an amazing debuff, most people expect gwf to get the Greater Plaguefire. I’m planning to run 2 swords one with vorpal one with greater plaguefire. I have been saved by my soulforged many times over. 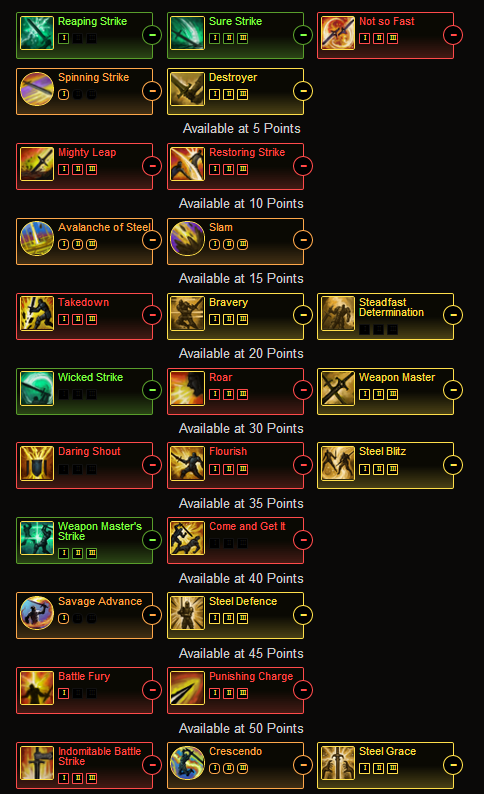 PvE soulforged is king at saving kits. Set 4: Your Encounter powers grant Onslaught. When Onslaught reaches 3 stacks you gain 1260 Recovery and Power. Onslaught lasts for 4 seconds and is refreshed each time you strike a foe with an Encounter power. Set 4: When you critically strike a foe you gain 5% damage resistance and 20% run speed for 4 seconds. Set 4: When you use a Daily power you gain 15% damage resistance and 15% run speed. Best way to roll is to use 2 piece Vigilant Warlord 2 piece avatar. Never go full avatar because no gwf can constantly keep onslaught with the long cooldowns on all of our encounters. A good replacement is Berserker Set T1+Bladestorm Set. It is possible to use full 4 set of beserkers as it gives you encounter cooldown, but I think recovery is important to a gwf’s success. 2. Do not enchant anything for recovery or critical, your crit and recov will attain 3k as you obtain your end game equipments. 3. Stack as much power as you can. I have upgraded to 2/2 Avatar Vigilant. Will Continue to upgrade for Module 1. Stone or Cat will do. Bonus stat makes you hit harder, unless you have Lillend, she’s really effective as a Devote Cleric*Cough* I mean DC replacement. 1 Add or boss: 1 Weapon Master Strike follow by 2 sets of surestrike or 1 Weaponmaster Strike + encounter. Roar if u can cancel casting(non boss). Unstoppable when u can, but never fully spend your stamina because you might need it to dodge red. I use rank 7 elderitch for last slot because 1000 stat and u gain 8.5 vs 9%, the difference is minimal. Don’t Go for Ancient offhand since you are wasting 300k ad more for less than 20 stats, unless you have rank 10s on everything. how do u move and attack so quickly with WMS ?